The L-Max® technology is a proprietary process that is the subject of International Patent Application PCT/AU2015/000608. The patent is pending in 148 countries, however in the International Preliminary Report on patentability prepared by the Australian Patent Office, it is acknowledged that L-Max® is novel, inventive, industry applicable and patentable. This conclusion represents a guide for other Patent Offices, before which national and/or regional phase patent applications from the international patent application will be presented in due course. The L-Max® process allows the extraction and recovery of lithium (chemical symbol Li) from lithium bearing micas such as lepidolite and zinnwaldite. These Li-rich minerals have largely been overlooked until the advent of L-Max® as a source of lithium as no commercially viable process existed to recover this metal, which is essential for many new battery technologies. As such, there is a tremendous opportunity for the Company to establish Li-rich micas as a recognised third major source of lithium (alongside brines and spodumene). At brownfields operations, Li-rich micas have typically reported to tailings. Such sources could lead to a low-cost and near-term entry point for the commercialisation of L-Max®. At greenfields sites, Li-rich mica pegmatites have typically been overlooked creating an exploration opportunity for the Company. L-Max® is a hydrometallurgical process that involves the direct atmospheric leach of lithium micas, followed by impurity removal stages and the subsequent precipitation of lithium carbonate. 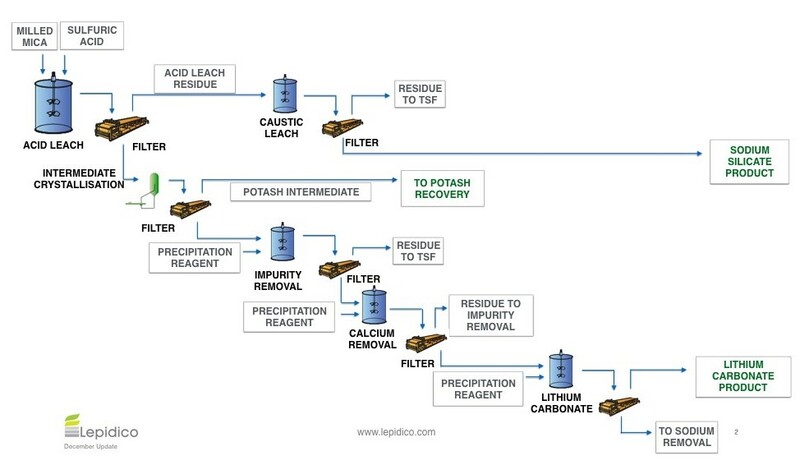 This differs considerably from the processing of spodumene, which requires high temperature decrepitation and sulphate roasting prior to lithium recovery – a relatively expensive process. Lepidico is seeking to commercialise L-Max®, which is characterised by employing low-cost, readily available reagents, industry standard equipment and is expected to have lower energy requirements. In addition, L-Max® has the potential to also recover valuable by-products from the Li-rich micas including potassium sulphate, sodium silicate and caesium/rubidium formate. Production of such by-products would further increase the competitiveness and attractiveness of L-Max® as a metallurgical process. Lepidico has already successfully completed a mini-plant trial utilising the L-Max® technology. 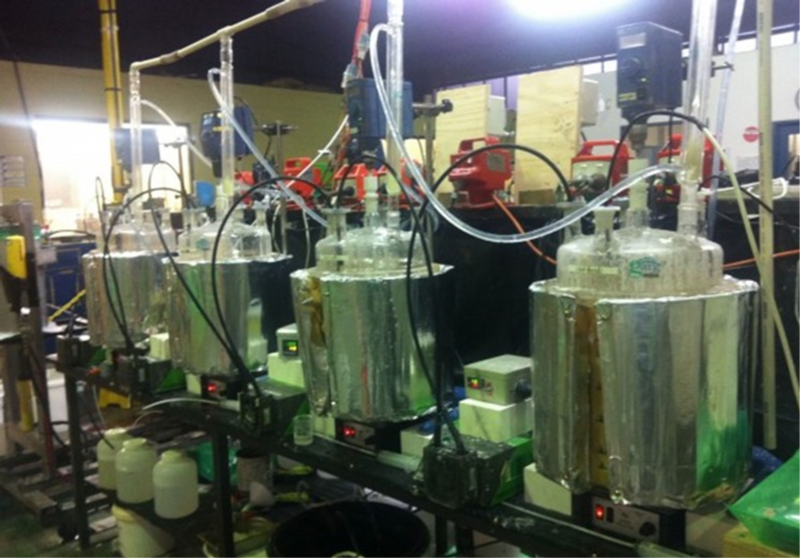 The mini-plant was run continuously for 140 hours, processing a lepidolite concentrate to produce lithium carbonate with a purity >99.5%. In addition, recoveries of more than 94% were achieved from the leach liquor. 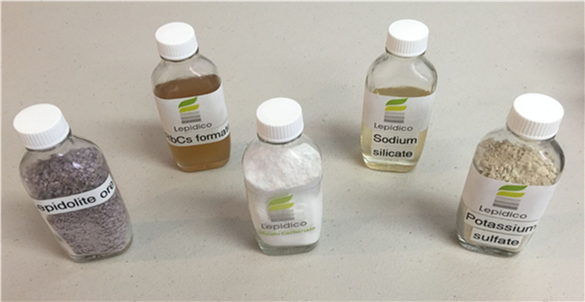 Subsequent to this mini-plant trial, Lepidico has also produced various by-products from the leach liquor generated.